Our partnership with Alpinehikers, one of the most highly regarded travel companies in the Alps, is behind every itinerary. Being inclusive and supportive is very important to us. We’re here to have fun! Each day includes a variety of options to satisfy every level of trail runner. A great trail running experience in the Alps includes delicious local cuisine, a chance to explore mountain culture, and shared experiences with friends new and old. 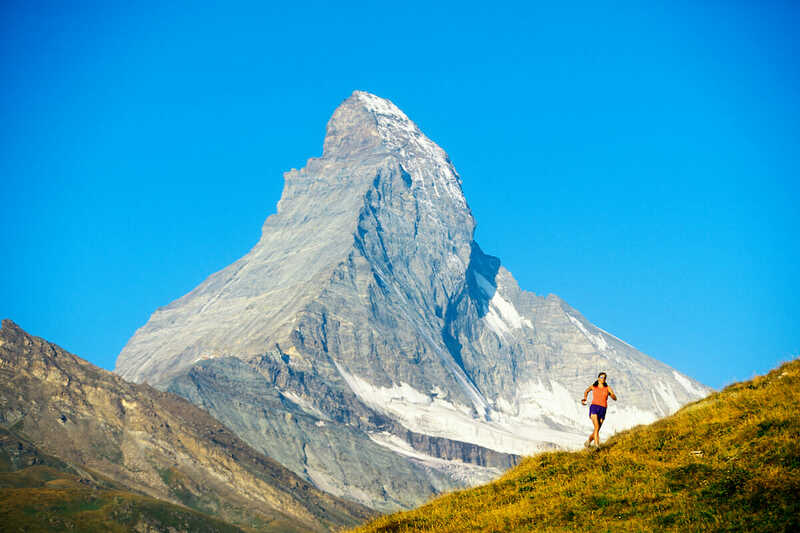 From gentle runs through the Alps to internationally acclaimed trail races and self-guided adventures, let us help you decide what’s right for you! Our most challenging trip, come run a dramatic new route through the heart of the Swiss Alps, pioneered by our friends at ALPSinsight. US ultra runners Jeff Browning and Krissy Moehl will be our hosts for this rare opportunity to experience Chamonix during the UTMB®. Trail run the Tour du Mont-Blanc from Courmayeur, Italy to Chamonix, France, with a chance to run in a classic Alps trail race. The “TMB” is the most famous trail in the world for good reason. Looping through France, Italy, and Switzerland, we’ll take our time running through iconic mountain terrain in 7 days, staying in rustic inns and hotels. Six days of trail running around Grindelwald and Murren, at the base of the Eiger. It’s some of Switzerland’s most scenic terrain. Want to participate in a classic alp trail race? Pick one of the five races in the Eiger Ultra! Run the Alps offers self-guided trips throughout the Alps. Run solo, with a partner or friends, on your own schedule, from Chamonix to Zermatt. Interested in taking part in a trail race? Take a look at our race partners! The Dolomites have some of the best trail running in Europe! We’ll run inn to inn, taking in spectacular views along smooth single-track trails and over high cols. At night, we’ll enjoy hearty local cuisine in village inns. Our Matterhorn Ultraks tour gives you the chance to enjoy a classic Alps trail race, whether you’re running or cheering others. We’ll enjoy trail time in Zermatt and the nearby spa village of Leukerbad.